Excited to share a new organizational series of “Plan With Me” videos. 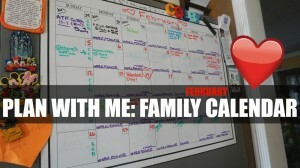 In this video I share how I plan our family calendar for February. I have been using this dry/erase calendar for almost 2yrs now and I love how convenient it is to see everyday on the fridge and how practical it is to use for the entire family. The different colors of Expo markers are also key! Hope you find this helpful!Thumbs up and comment if you want more videos like this!